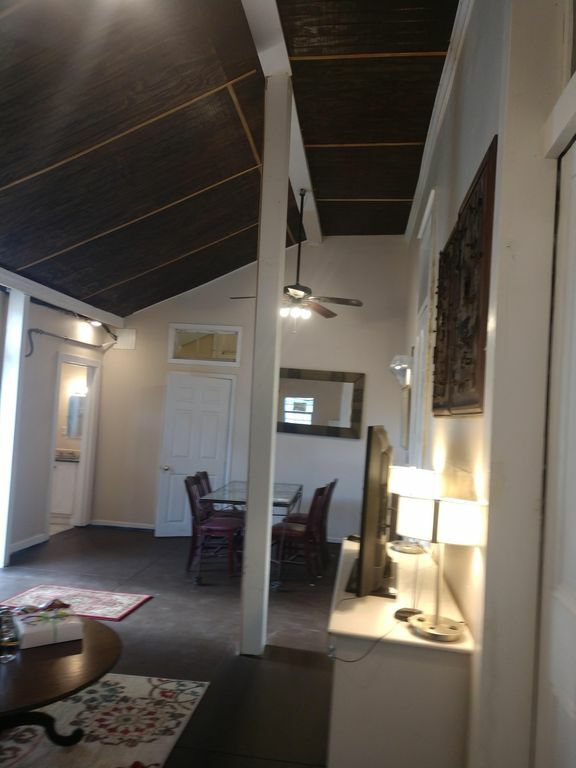 Rental located inside a Old New Orleans style house, Built in 1839. The rental is private along with a full bathroom and shower. Ideal for a cost savings vacation or business trip. Queen size bed, Single couch. Towels Provided, Sheets Provided and Pillows. Wi/Fi included. This rental is not a hotel, with hotel services and Hotel cookie cutter room. The price is set for a travelers on a budget. If you are on a Honeymoon or Anniversary this is NOT the rental for you. I would suggest get a Honeymoon suit at a Hotel, they have a gift shop. Regular size fridge, microwave and a coffee maker. NO OVEN. Off Street Parking for 1 Car. You are located in the Garden District a very beautiful area of New Orleans. 2616 Magazine St.
Magazine St. has it all! 48 restaurants to choose from. You have a great corner restaurant (Traceys). The Zoo and Audubon park is on Magazine St. Walking distance to many great places. There are two additional rentals available. Please view Listing# 632667 698822. If you want to feel the New Orleans VIBE- If you want to be in a Old New Orleans Mansion Built in the 1830s-This is the House for you. If you want Holiday Inn style-THIS IS NOT THE HOUSE FOR YOU! Built in the 1830s- You will feel like you are going back in time. Located at 2616 Magazine St. New Orleans. You are walking distance to 50 Restaurants on Magazine St, along with endless shopping. Close to everything. Owner was friendly and available if I needed to get in contact. Place is highly recommended. The accommodations were clean and very quiet alowing for a quality nights sleep. The bed was comfortable with the private bathroom containing a walk-in shower located adjacent thereto. The eating and kitchen area are rather large, furnished with quality chairs and table, tv,and two large ceiling fans. It is suitably lighted. In the kitchen is a full size fridge, a coffee pot and a micro. WiFi is included. As mentioned in the advertisement, this is not the Hilton. Perhaps it is better because of the no hassle entry or leaving. Parking is included in the backyard as well. Well placed for easy access to downtown via public trasnsport. Alex, the property manager is very approachable and will assist where possible. Nice owner, good area and safe. Plan on bringing your own bottled water's if you're a coffee drinker, bring your own grounds and creamer. The worst part was the bed. It was once of the most uncomfortable we've ever slept on, and would have slept better on the hard floor. Other than that, it was a really nice stay. Your coffee and creamer were in your kitchen cabinets up top. Bottle water is provided. The bed is new, I get great compliments. Sorry wasn't for you. My fiance and I traveled from Mississippi to stay in New Orleans for Spring Break, and we were blown away by how amazing our stay was. Alex was very helpful and was there when we arrived to see that we were settled and taken care of. This property was easy to find and everything was comfortable and relaxing. Thanks so much for making our first trip to New Orleans a great one! Alex is great!! He was prompt and very helpful if we needed anything!! Great experience!! This apartment is a hidden gem on Magazine St. It is in a great location and the space is perfect! Alex is an awesome host and is helpful and very nice. St. Charles Street is in walking distance where you can catch the street cars, there are a lot of restaurants on Magazine St. to eat and enjoy cocktails. You could not ask for a more perfect location and space, highly recommended!! !